Description: pushing the long coal train. Description: Ex-So Pac AC44 is in consist of NS 82E, heading east through Berea. Description: A patched SP unit is the DPU on a eastbound coal train pushing toward Chicago in fading afternoon light. Description: UP eastbound coal train on UP Geneva Sub with ex SP helper just before sunset. 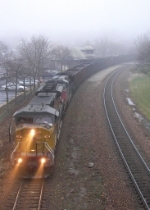 Description: An empty coal job runs through Kirkwood in heavy fog as UP Train CUGSM9 27 as 3 phoamers observe from the bridge. Spiv, IKE and me were the said phoamers. Pat already went home. Description: Three faces on the BNSF mainline through Jonesboro. Description: An ex SP GE brings up the end of a coal train. Description: A quintet of engines from the west lead oil through the city at 1513. Description: Built July 1995 as SP 308. Description: Ex-Southern Pacific #308 that was built in July 1995. Description: My second ex-SP unit that Ive seen at this rock loading site! Description: A close up of the cab. Description: UP 6355 AC44CW takes a break after dragging a unit aggregate train into UP's Peach Yard, once a Rock Island facility. UP 6355 was delivered to Southern Pacific as SP 308 AC44CW in July 1995, one year and two months before the end of Espee, becoming UP 6355 with a patch on January 31, 2004. Description: UP 6355 AC44CW and CSXT 7346 C40-8W roll into Peach Yard with a unit aggregate train. UP 6355 was delivered to Southern Pacific as SP 308 AC44CW in July 1995, two months before the end of Espee, becoming UP 6355 with a patch on January 31, 2004. CSXT 7346 was delivered to Conrail as CR 6163 C40-8W in February 1993 becoming CSXT 7346 in February 2001 complete with YN2 paint. Peach Yard was once a Rock Island facility but is now operated by Union Pacific. Description: Working with some NS power at the A.O. Smith Yard in Granite City, Illinois. Description: This grain train was brought into Stromsburg before floods wiped out the Platte River Bridge for the NCRC Stromsburg Sub in Central City. Until it gets rebuilt, the train and it's power are stuck here.